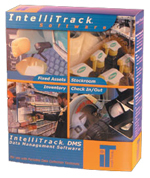 IntelliTrack Stockroom inventory control software tracks consumable inventory. IntelliTrack Stockroom controls the receipt and issuance of consumable goods into inventory. inventory software supports many companies who need a stand alone receipt and issue inventory control system. Any company that wants to track the "ins" and "outs" of items are ideal candidates for IntelliTrack's StockRoom inventory software. Users can create custom reports, forms, and queries with Access 2002/XP. Imports or exports ASCII or text data for shared use with other software systems. There is almost no limit as to how you can describe and track items. Gives you meaningful information so that you can make informed decisions. Point and scan to issue, receive, and conduct an inventory. Find out what is missing. Helps to identify shrinkage and maintain an accurate inventory. Know exactly when an item was issued, received, moved, inventoried, or added. You will know exactly what you have and where it is located. User names and passwords allow you to restrict a user to "view only" access, or five other levels of access. See who is using what, giving information you need to make informed and sensible business decisions. Lets you deploy the database on a server and access it remotely from a LAN. Important in eletronics, pharmaceuticals, laboratories, and others. Helps to maintain consistent data and data integrity. Simple and straightforward help online. You can manage an unlimited number of items at unlimited sites and locations.